Despite the news being dominated by missing jets and Russia’s continued excursion into surrealist drama in the Crimea, the real interesting news for China based expatriates is elsewhere. The real interest is the people’s currency, the Renminbi and its sudden change in direction. Since 2005 the Renminbi has been the steadily rising against the USD. In fact it has been one of the most consistent trends in finance during that period, rising from 8.2 to 6.04 just two weeks ago. That trend has changed quickly, at least for the RMB since it has now weakened quickly to 6.17 as of last night and looks like continuing. It now looks like a ski jump heading up to the sky. 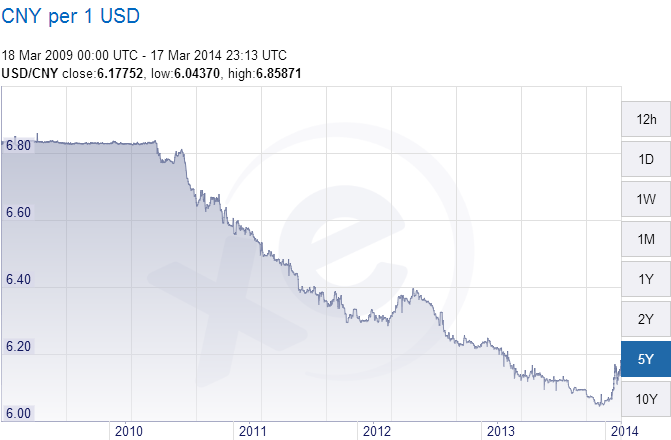 We saw the day the RMB would stop rising coming. That’s not an idle “I told you so” based on misremembered bar musings. We even wrote a research article on our website on this precise topic in July 2012, predicting the RMB would not get past 6 to a USD. Read the article here. Much of our reasoning remains the same today as it did then. In the end the RMB got mighty close. We also sadly didn’t make any large scale bets or investments in our view. The government has said that it didn’t want the RMB to be a one-way bet which was encouraging speculation. There could be truth in this, although the government might have been more relaxed about fluctuations if the RMB was at or above the level it deems fair for the RMB. Given how overseas investment into China for export industries has stalled completely in recent years, this seems accurate. To further support our case, the latest edition of the Economist discusses inflation in China and how, in recent years at least, inflation has been underestimated. For anyone living in China over the last 7 years, this is not news. The only thing about visiting London or New York these days from Shanghai is how reasonable the prices are overseas. A falling currency is a better reflection of that lack of (and falling level of) competitiveness. The days of an easy 6% per year simply holding RMB are over. In fact, we wouldn’t be surprised to see the RMB bounce around a bit, but ultimately decline at 5-10% per year for a couple of years. Inflation in China remains higher than the US or Europe. 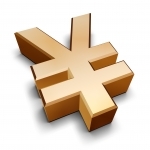 The RMB will become a normal currency. There is minimal government reform outside of finance and banking. Government barriers to effective competition continue to rebuild themselves following the reforms of the 1990’s under Zhu Rongji and WTO pressures. If you want to make good easy and safe returns, you are now going to have to look at overseas options in foreign currency options. The good news is there is a world of options out there. If only you knew an adviser who specialized in foreign options.